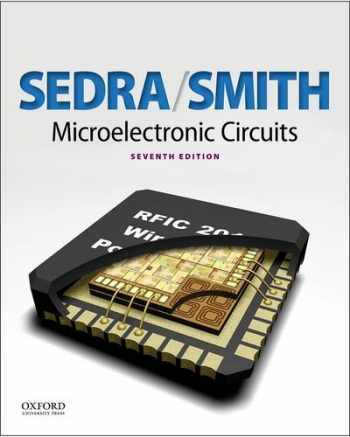 Acknowledged author Adel S. Sedra wrote Microelectronic Circuits (The Oxford Series in Electrical and Computer Engineering) 7th edition comprising 1488 pages back in 2014. Textbook and etextbook are published under ISBN 0199339139 and 9780199339136. Since then Microelectronic Circuits (The Oxford Series in Electrical and Computer Engineering) 7th edition textbook received total rating of 4 stars and was available to sell back to BooksRun online for the top buyback price of $52.43 or rent at the marketplace. This market-leading textbook remains the standard of excellence and innovation. Built on Adel S. Sedra's and Kenneth C. Smith's solid pedagogical foundation, the seventh edition of Microelectronic Circuits is the best yet. In addition to updated content and coverage designed to reflect changes in IC technology, the text also provides the most comprehensive, flexible, accurate, and design-oriented treatment of electronic circuits available today. Amply illustrated by a wealth of examples and complemented by an expanded number of well-designed end-of-chapter problems and practice exercises, Microelectronic Circuits is the most current resource available for teaching tomorrow's engineers how to analyze and design electronic circuits.